Catan escaped from the review in a better state than might be expected given how viscerally I dislike the experience of play. I gave it three and a half stars in the review, but I’ve only rated it three out of ten on Boardgame geek. That reflects the fact it is an obviously good game that I will never willingly play. But come on – who needs my view on Catan? If there’s any game that we’ve looked at on the blog that needs a preamble less, we haven’t yet found it. What you want to know is – how likely are you to be able to play? Let’s find out, together! I’ve got wood for a teardown. Two wood for a teardown? All my wood for a teardown. COME ON WHY DOESN’T ANYONE WANT MY WOOD? Colour blind support is not great, but it’s also not game-breaking. It’s primarily an issue for ease of identification of terrain areas. Look at the Isle of Catan for those with Protanopia or Deuteranopia – it’s like the blasted lands of a post-apocalyptic hellscape. Quarries, grasslands and farms all share a broadly overlapping colour palette that loses all the ‘at a glance’ identification that someone with full colour differentiation would enjoy. 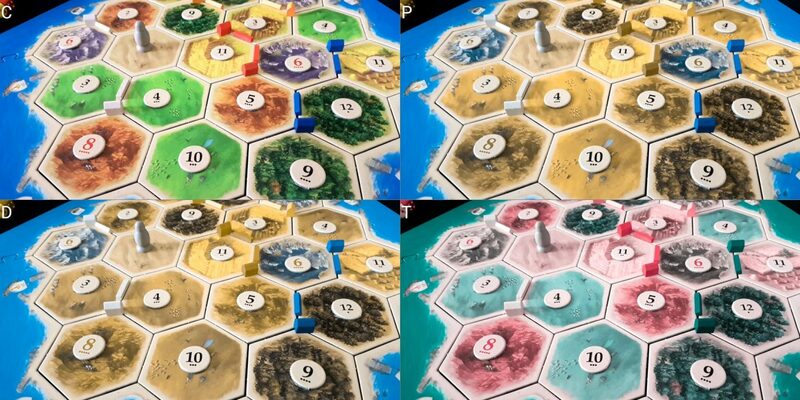 The view of Catan on the top left offers many visual cues as to areas of resource importance. The others – not so much. But it’s important to say here that no information is actually lost because each tile can be told apart thanks to the different artwork and textures. Clay versus grassland is more differentiated in that respect than it is in colour, and wheat versus any of them is marked primarily by the rows of tilled land. The desert too is possible to tell apart because of its barren design. 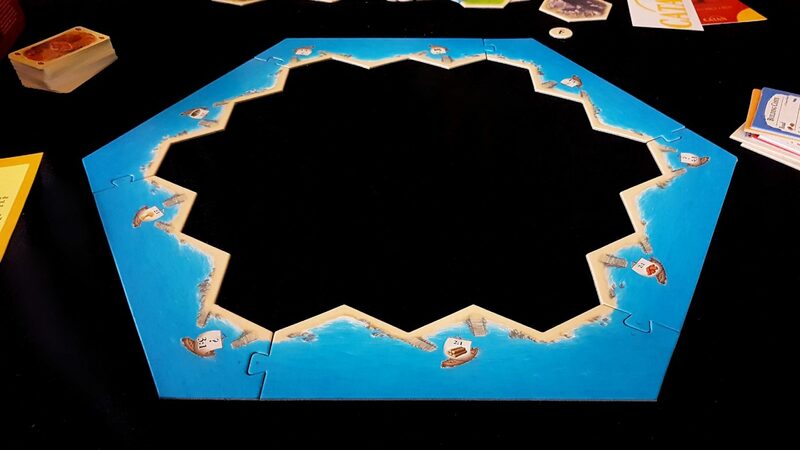 It’s true that these aren’t necessarily the most obvious features when Catan is viewed at even a medium distance, but lack of colour discrimination won’t make the game unplayable. It’ll just be a bit more unwieldly than it should. With regards to the four colours available for players, these are again identifiable although the palette differentiation between red and orange is rarely going to be ideal – reds, browns and oranges form a set of colours that has a high risk of palette overlap. It’s not terrible in this case, and in all but the worst manifestations of colour blindness close inspection will reveal which is which. It’s still a suboptimal colour choice with such a small set of colours. You can see from the ‘pile up’ below that while one is noticeably different from the other, you might on occassion find it trickier than it should be to identify which is which without a direct side by side comparison, particularly in conditions of poor lighting. All of this is to say that we’ll recommend Catan in this category, but begrudgingly. It’ll be fine for three player games, mostly okay for four player games, but a better colour palette or more strongly expressed differentiation at a distance would be very much welcome. 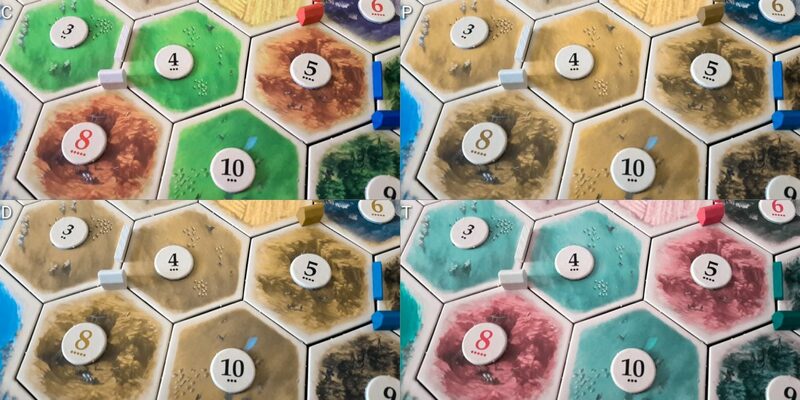 Assuming there’s no intersecting complication of colour blindness, the board of Catan is visually distinct enough in terms of terrain types that it should be possible for those with minor to moderate visual impairments to make out the shape and distribution of tiles. There is a ‘set map’ too that can be employed to ease the problem for visually impaired players – rather than worrying about the random distribution of hexes (that’s what we used in the review) you can learn the layout from the accompanying manual, which also serves as a quick reference. You lose some variation in this respect, but gain a lot in terms of game state tractability. Dice are used as part of play, but they’re standard d6s and as such accessible replacements would be perfectly appropriate here. You need two of them ideally, but there’s nothing to stop you rolling one twice and summing up the result. A few months ago, I had a student from Duncan and Jordanstone in Dundee come see me about accessibility in board-games and she told me about a visually impaired gaming group in Edinburgh. She showed me some photographs of the state management they were doing when playing Catan – mostly it worked by transposing the fixed grid into a larger whiteboard format and using that to track resource availability and building plans. While this isn’t possible for many games, Catan has the same trait as Codenames in this respect – the small number of moving parts ensures it translates well into play with supporting aides. You could easily enough generate a spreadsheet that would hook into existing digital accessibility tools without real difficulty. The state of the map changes only incrementally, and such you can keep up with what’s happening in a way that other games don’t easily permit. I tend to shy away from making accessibility suggestions in these posts. As a relatively able-bodied gamer I don’t feel comfortable in offering my view as to what is and is not appropriate or obvious – accessibility is very much an embodied experience. However, I consider this one endorsed by people with actual visual impairments and they certainly are of the opinion that it’s workable. It’s good that this apparently works though, because otherwise peering over the board is going to be awkward. The numbers are provided via small circles that are overlaid onto the map, and while these are fine in and of themselves it’s also the case that you won’t necessarily be looking at tiles individually. More often you’re looking at clusters of tiles, since a settlement will usually nestle between two or three of them. As such, knowing the statistical distribution of resources and the adjacency of other settlements is important and the map doesn’t lend itself particularly easily to this. The cards are clearly structured and offer high contrast but they suffer from the weird ornamentation that serves as a backplate to the text. This takes that which would be visually accessible and turns it, needlessly, into something less optimal. Those with full visual discrimination can easily read the text. Those with less precise differentiation will likely find the text too noisy for comfort. However, there are only a handful of cards in the game and their effects are easily learnable. Anything with a purple header is a knight. Anything with an orange header is a secret victory point. The other three kinds of cards have special effects, and only three that need memorised if the text is unclear. The parsimony of options here is what saves it from being visually inaccessible. Resource cards too are reasonably distinct, but really you can replace them with any tokens that might offer tactile identifiers provided you have a way of hiding them from other players – in a cup, or a little bag, or just behind a screen would all be fine. We’ll recommend Catan in this category. It would be ludicrous not to because we know for sure there are visually impaired players that can and do make it a part of their gaming evenings. Bear in mind though it requires a degree of will to track game state in an external tool, but there are sufficiently few moving parts for this to not be especially onerous. Catan is not an especially complex game but you can draw some reasonable inferences from its durability as a cultural property. Its longevity argues convincingly that it’s not simple. On the surface it’s a game of rolling dice, collecting cards, and spending cards. All of the things you can buy are listed on a handy reference card that every player gets in front of them. There aren’t many of these, and they are your only direct interface to the game. There is a reading level required, but it’s not high – mostly it relates to the development cards, and there are only a handful of these. These are bought and held in secret, which might make it a little difficult to do effective hand management and support if a player has severe cognitive impairments. However, this can be solved by employing a little crib sheet that simplifies the effect. ‘Road building = 2 free roads’, ‘year of plenty = 2 free resources’ and so on. There are ways around the text on the cards in other words, although they may require a kind of symbolic language if literacy is an issue. Always bet on black. Or never bet on black. Or sometimes bet on black? 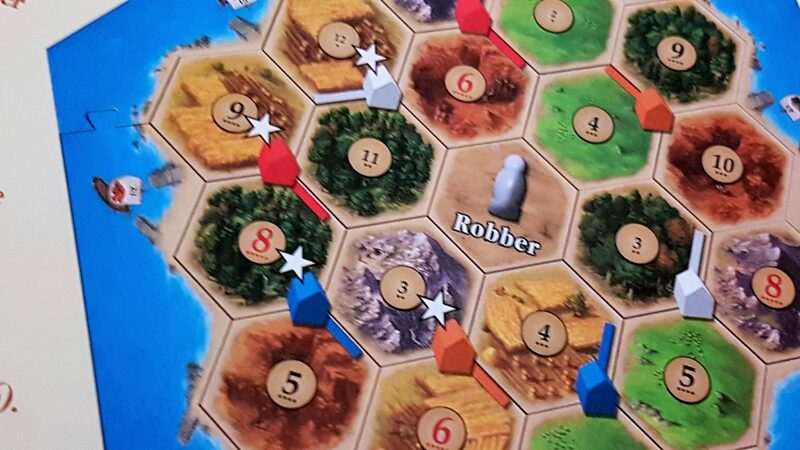 But here Catan does an interesting thing with the board – each of the numeric circles that get placed around the map shows the relative chance the number will be rolled, with six and eight (the most advantageous resource numbers) being marked in a vibrant red. I love these pips, I really do. 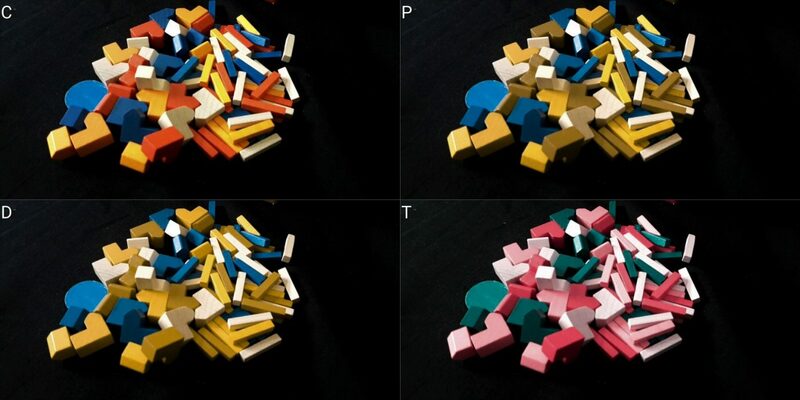 Thus while probability is a key part of play, the visual design of Catan has turned it into something more arithmetic. While this doesn’t eliminate the need for strategic thinking when it comes to placing settlements, it does mean that the casino-esque ‘tipping point’ of payout in any hex can be calculated by adding the pips together. 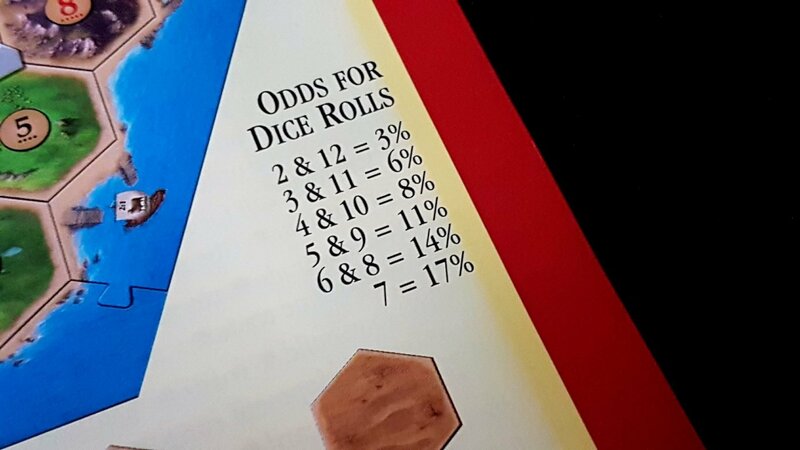 A two and a twelve have a one in thirty-six chance of being rolled, so they get a single pip. Pair that with a six and you’ll have a settlement that has an eight in thirty six chance of paying out, or a one in four. On the other hand, building a settlement in the junction between a five, ten and nine has a one in three chance of paying out. Nobody needs to do the explicit arithmetic for this. Indeed, not doing it is probably better because those that rely on the dice are doomed to be defeated by them. However, it hugely reduces the cognitive cost of assessing settlements through nothing more than providing a few pips. In case you didn’t realise, I love this. It makes the puzzle of probability easier for absolutely everyone. Of course, you may be interested more in what is going to pay out most often rather than the chance a settlement will generate something, but it makes that easier to work out too. However, while this is an excellent design feature you can’t get away from the fact that you’re still trying to pick settlement locations in contention with other players and according to a modulating value system. Bricks and clay are super important early on. Wheat and stone are more important later. 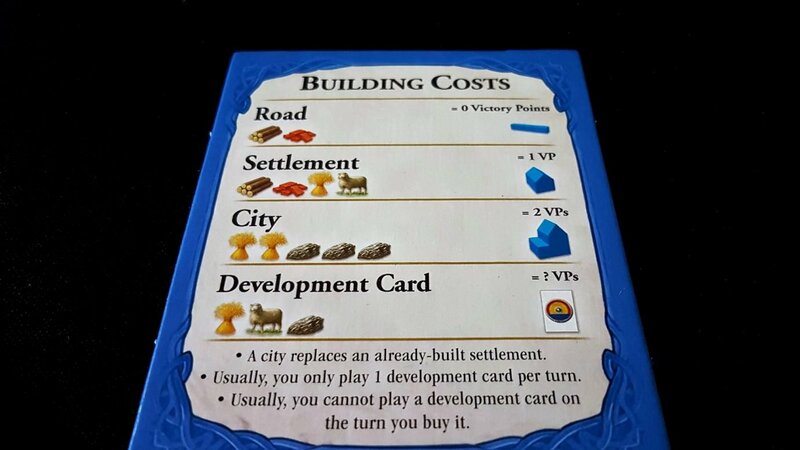 Sheep have value primarily for settlements and development cards, and the latter are numerically limited. Your plan for settlements has to take into account reliability of resources, ease of port access, and the excess supplies of other resources your opponents might have. If you’re all huddled around the same high performing tile, you’ll find it hard to trade because everyone will get their payout at the same time. It’s strategic impact like this that gives Catan a real and lasting depth. It’s also what makes trading fraught from a cognitive perspective because value is a property of availability. There are fewer mountain and clay tiles than there are wheat, forest and grassland. However, if all you’re rolling are the mountains and clay then the rest will have a greatly increased value. Trading with players might involve deals like ‘I’ll give you three stone for a sheep’ and the time at which that deal should be made is tightly coupled to resource generation. Knowing what’s a good deal and a bad deal is key to getting the most out of the player marketplace. Importantly too, knowing who to deal with if offered equally good deals – identifying who is likely hoarding secret victory points, and who has been collecting enough stone that you should be suspicious of trading them a wheat. That’s expensive from an information processing perspective, but also hugely costly from a memory perspective. There’s no real synergy of rules in Catan, but there is a kind of low-level chaining effect that can be very powerful if exploited properly. Knowing how to spend resources is key to getting the most out of your turn, and balancing between ‘enough resources to make things happen’ and ‘few enough resources to avoid the ire of the robber’ gives you little leeway. So in one turn you want to make sure that you accomplish everything you can, because you might not get a chance in the next turn. You can’t just incrementally build up a supply until you can bring the magic – every turn you have more than seven cards is tempting fate. You need to time your actions, and your resource acquisition tactics, carefully. Knowing that everyone has been rolling sheep might mean it’s time to play a monopoly card even if you don’t need them, because you do have control of the special port that will let you trade sheep two for one. You might trade away ancillary resources to take advantage of that beforehand too, provided you can convince people to go for the deal. The value of a sheep, in other words, is contextual. You might even choose to give away all the sheep you have in one deal only to claim them back in a monopoly the next before finally trading them in en masse for what you really need. Playing the road building card at the right time might allow you to block someone getting the largest road, or throwing a robber at a particular tile might prevent an opponent from building the city you know they’re working towards. So, with all of that Catan is unlikely to yield itself to an enjoyable experience when dealing with cognitively impaired players. Too much planning, too much relative evaluation of resource importance, and too much to memorise. You can play without all of this, of course, but you’ll find it a peculiarly soulless experience of futile dice rolling. We don’t recommend Catan in either category of cognitive accessibility. In my teardown of Blood Bowl, I talked about how it’s the only game I have where I look at people rage quitting on me and genuinely think ‘yeah, that was the only sensible response to what happened there’. Catan is the only game that I am liable to rage quit. This is sufficiently true that I won’t even play it with other people. If I play it, which is rare, I play against AI bots on the mobile app because I can switch them off any time I like. Catan is a game that is borderline cruel in the PvP model it presents to players, and it hits all my emotional buttons at the same time like a mischievous kid in an elevator. I gave a couple of examples of this in the review, but let’s reiterate the key elements of the game that are likely to drive reasonable people to incandescent anger. The first is the extent to which ganging up is not only permitted, but practically mandated. The first player to ten victory points wins, and you know (within a broad certainty window) where everyone falls in that calculation. There are secret victory points a player might buy, but otherwise your points are all there on the table. If you’re the leader in the game, you better be content having things happen to you because your days of happening to other things are largely over. First of all, it becomes hugely disadvantageous for anyone to trade with you. As a general rule if you are willing to make a trade it’s because you get some benefit out of it. If you’re in the lead, nobody will be willing to give you that benefit and so you’ll find your trades declined even when they would otherwise be of mutual worth. True, this isn’t a universal feature of the game but I’ve seen it happen so often and so consistently that it may as well be written into the rules. Catan doesn’t have a king-making problem – it has a king unmaking problem. It’s like Game of Thrones – as soon as someone claims the crown then everyone bands together to behead them. That would be frustrating enough because this will end up leaving you entirely at the mercy of the dice. However, the provision of abundant knight cards in the deck, and the activation of the robber through random rolls, means that you’re going to find yourself the repeated and intentional target of aggression simply because you pulled ahead of the pack a little. Playing a knight card allows someone to move the robber, which will almost certainly be to one of your tiles, and then claim a random resource from a player with a settlement adjacent to that tile. And then if you roll a seven they can move the robber to another of your squares and steal another resource. When the robber occupies a tile, it doesn’t pay out either – each time you’re the target of the robber you’re put in an intensely disadvantageous position. It’s entirely possible to start a round of Catan with almost enough resources to do something cool only to find by the time your turn comes round again you’ve got nothing left in your hand. And that leads to the other issue of emotional accessibility – not everyone is going to have as much fun playing as everyone else. Not everyone is going to get the same opportunities to do things, purely because of the way the random generation of resources works. It can feel like the dice are malicious in a game of Catan. The numbers will follow the correct distribution over a long period of time, but they won’t necessarily behave the way they should during a shorter timespan such as the length of your average game. You can end up, through no fault of your own, seeing twos and threes and elevens and twelves being rolled far more often than the sixes and eights you banked on. When you get the rolls you need, Catan is a lot more fun than when you don’t. There are some special variations and add-ons you can get to alleviate this (bonus resources and card-stacks for example) but even so – this system can feel arbitrarily cruel. All of this would be okay if you had enough you can do without resources to have fun regardless. The problem is that if you don’t have the right quantities of the right resources, you simply don’t get to do anything. Your turn comes around, and you have to say ‘I pass’, and this might happen several times in a row. And even worse, when you finally do roll the resources you need it’s perfectly possible for one of your fellow players to steal them from you before you get a chance to use them. We don’t recommend Catan at all in this category. It’s no fun to lose in Catan, and it’s too easy for people to engineer the circumstances under which losing happens. This will be fine for the right group. If you’re reading this section with an eye to evaluating the suitability of Catan, I’m willing to bet cash money that the right group isn’t yours. I’ve had enough feedback from the Catan review to suggest that this isn’t my own idiosyncratic take on the game – there are dozens of us. DOZENS. Here’s another feature of Catan I absolutely love. It’s a game that makes use of randomly distributed hex tiles to make the board, It does it though in a way that solves the problems we tend to discuss with regards to dislodging the pieces or creating ‘alignment shockwaves’ when someone nudges the table. 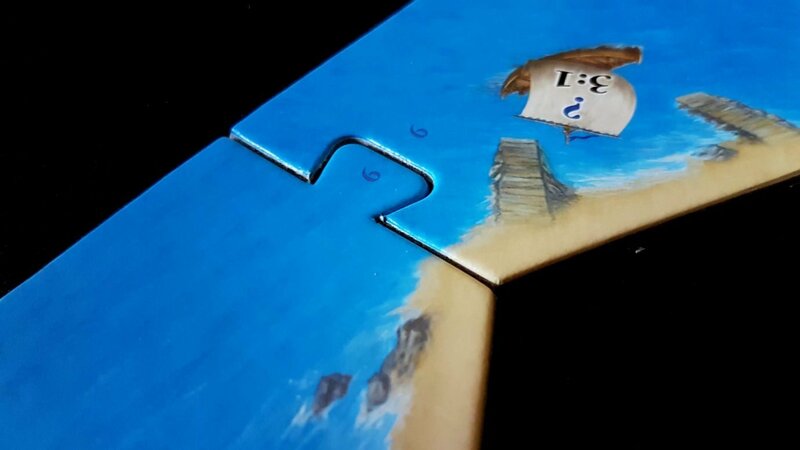 It gives you a little frame that you build, jigsaw style! This simultaneously ensures the board has the requisite shape and protects the game state against the occasional disruption. It’s such a good feature that, unique amongst tile based games we’ve looked at on Meeple Like Us so far, you can actually move the whole game around the table without upsetting anything – provided you’re careful. I love this so much. It’s not perfect though, although it easily could be. One thing that’s missing is grid or hex references that would allow for unambiguous identification of locations on the board. Generally though you can find some identifying description that precisely highlights a location, but at more of a cost than I’d like. The hexes don’t fit too snugly into the frame, which actually a blessing – it means it’s easy to slot a map together, and it also means that you can use the grooves to help align the roads so that they are a little more solid in their placement than they might be otherwise. That’s also not a perfect system, but it’s convenient at times. Placing settlements and cities doesn’t require especially fine control – as long as they end up in the appropriate intersection of tiles, it going to be fine. Roads are a little fiddlier, but placement of those can be done roughly before being fine-tuned by someone else if needed. And, since the game state is quite tightly constrained within the frame, it’s not necessary to worry about board sprawl. Even those that are unable to make game changes on their own behalf should find the game broadly playable with the support of a couple of card holders. Due to the robber, hands rarely go too much over seven and collected development cards don’t need to be held in hand – just made available somewhere for when they’re to be played. The only slight worry I have here is that when stealing a random resource from a player the convention is to hold out a hand and let them select which card they want. When dealing with a card holder, some information is going to leak out assuming some degree of collecting resources by category has been performed. This though is easily resolved by taking the cards, shuffling them, and then drawing one at random from the newly shuffled set. It’ll be a little inconvenient if someone is on the hook for repeated robbing, but it’s certainly workable. If the game gave more options for referencing tiles without ambiguity we’d offer a strong recommendation here. As it stands though, our support has to be a little more muted. Still, that frame is a superb inclusion. I’m not going to touch on the themes of colonialism that some have read into the game, other than to say ‘some people have read themes of colonialism into the game’. If you’re interested, you can find abundant commentary on the myth of Terra Nullius and the imperial conceit that accompanies the idea that resource rich lands are ever found without their own indigenous populations. The box art does include a woman on the front, although since we play what is primarily a kind of historical animus the characters on the front don’t actually relate to us as players. What card art is present shows either abstract resources or various scenes of pastoral life. 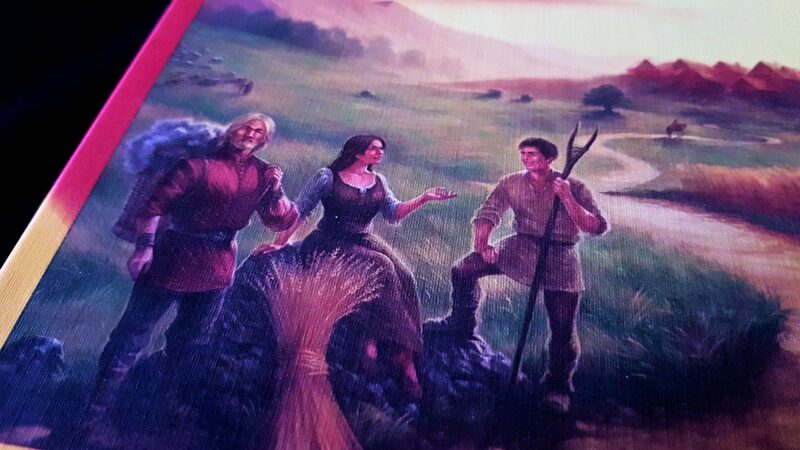 All characters in those are represented as background dressing – while women are definitely a minority on Catan, for the most part humanity in general is only a bit player. The only place that’s not true is in the knight cards, which are interesting in that a) they’re all men, and b) they have a range of different men including some older grey-haired gentlemen. Catan is also an intensely white nation state, but it doesn’t seem to suffer too greatly from ageism. The extent to which you might find this vexing depends on how important you consider incidental art – there’s nothing specifically gendered about your role as an agent of play. The manual unfortunately does default to masculinity in some passages, but it’s sporadic and as such I don’t think it’s intentional – most of the text is in the second person. Occasionally though, such as with the Knight entry in the almanac, you’ll get something like ‘if he has no cards, you get nothing’ or ‘you can break an opponent’s road by building a settlement on an unoccupied intersection along his road’. Explanatory examples make use of men and women. In term of cost, Catan has an RRP of £45 which is an eye-watering sum to pay for a game that really only works at three and four players. It’s a game that’s stood the test of time, so you’re not exactly taking a risk on it being a temporary flash in the pan. I personally don’t think it is remotely worth that sum. I got my copy for £30, which was still a large enough outlay that I resented it. That though is because I don’t actually like the game – at £45 it was an absolute non-starter. It is not a game that seems like good value for money, and for that money you can get any number of games that are more likely to be guaranteed crowd-pleasers than this comparatively crusty 20 year old relic. It’s very clear that Mayfair consider Catan to be a premium, prestige brand and they have priced it accordingly. 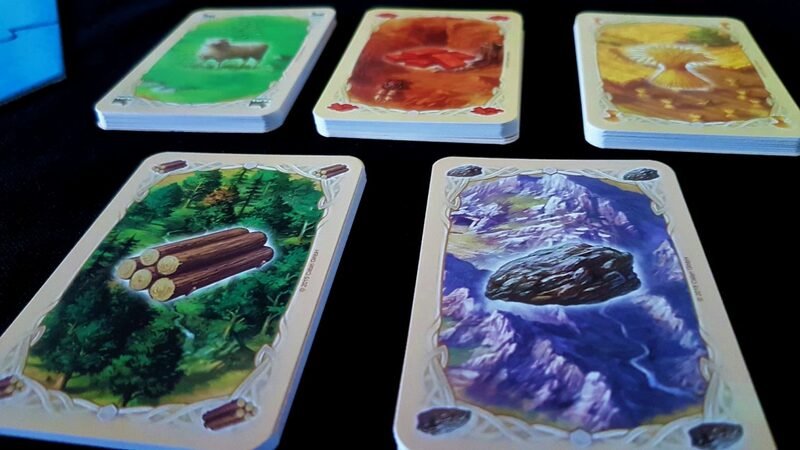 Overall then, we can only tentatively recommend Catan in this category – if the game resonates with you, you’ll likely get your money’s worth. However, you’re taking a gamble and there are many more reliable games we’d recommend for the same price that don’t have the same restrictions on player count. 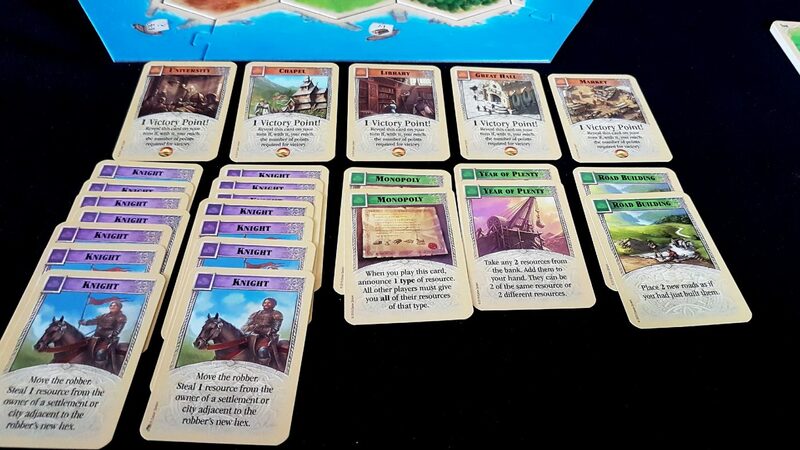 Trades in Catan can be as simple as saying ‘does anyone have wood for sheep’, and since there are only five resources you won’t be making use of a complex vocabulary even in more sophisticated trades. The act of offering a trade reveals game information too, as does the act of agreeing or making a counter offer. If you’re planning to make a trade, there’s nothing to stop you putting your proposed deal on the table for everyone to see and visually negotiate. However, it’s certainly possible for deal-making in Catan to be more nuanced. You might want to talk someone into accepting your deal over that of an opponent, and that might involve a degree of bluffing and construction and expression of a cogent argument. ‘You can’t trade wheat to Pauline because we know she has three stone – she rolled stone earlier in this round, and it came up in her city. She also has stone from an earlier round. If she wants wheat, it’s because she’s ready to make a city and that’ll give her a victory point when she’s got four hidden development cards that might be victory points. Make the deal with me – I’m no threat to you’. Or you might want to structure more complex deals, such as ‘if you make this deal with me, I’ll act like a port for you in the future except I’ll let you trade any three resources for one I have of your choice’. In a horse-trading heaving session of Catan you might lose out by not being able to clearly articulate nuanced deals or the consequences of such. This won’t be game-breaking necessarily if everyone sticks to the simpler deals that are technically the ‘correct’ kind. If you want something more vibrant, this should be something you take into account. Overall though we recommend Catan in this category. 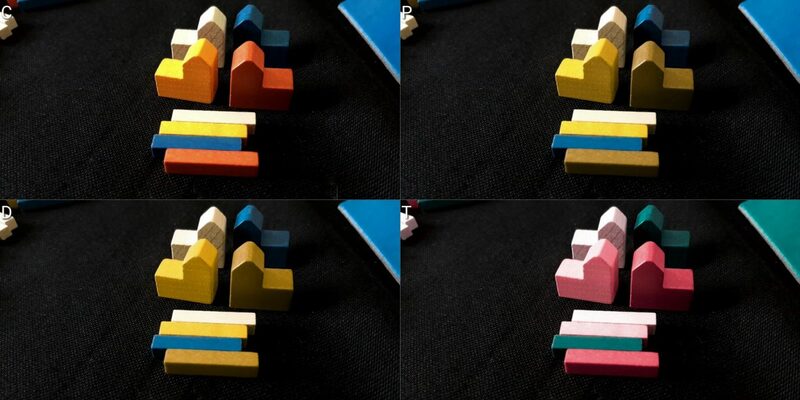 The ease with which the board yields itself to visual differentiation is closely coupled to the extent to which colour blindness impacts upon a player. The vibrant colours would lose much of their potential to differentiate if they merged into a single palette, and we’d move our recommendations for both categories one classification lower as a result. There are some hidden hands in Catan, but they tend not to be very large or complex. The relatively small number of options there mean that there isn’t much that might need queried by a player with cognitive, physical or visual impairments. As such, it needn’t be like asking ‘what does it mean when I have all cards that are hearts’ in a game of poker. Instead it can be ‘Hey, can you remind me what all the special cards do?’ and since there aren’t many you can reel through them all. There’s some symbology present on the reference sheet, but it’s striking in how straightforward it is – it just shows you what resources each thing costs. Since you can only construct a handful of things, this again is relatively easily committed to memory (absent any cognitive impairments) and in any case is clear and easy to understand. 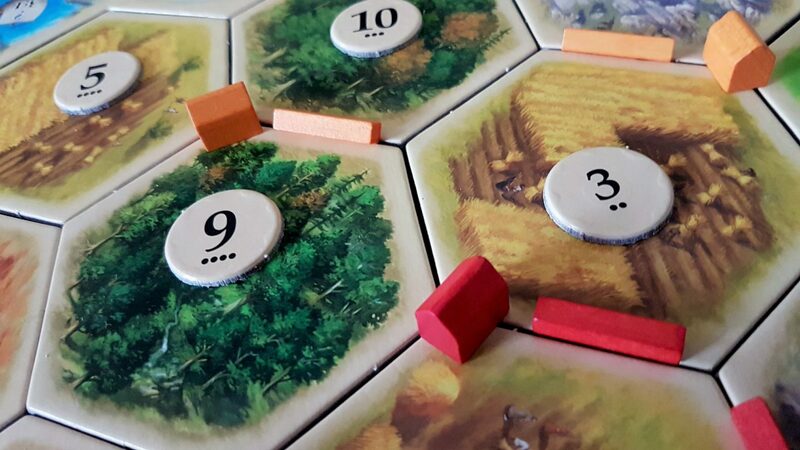 As Catan can be an intensely cut-throat and competitive game, this can disincentivise players offering accessibility support when that would undermine their own efforts at play. 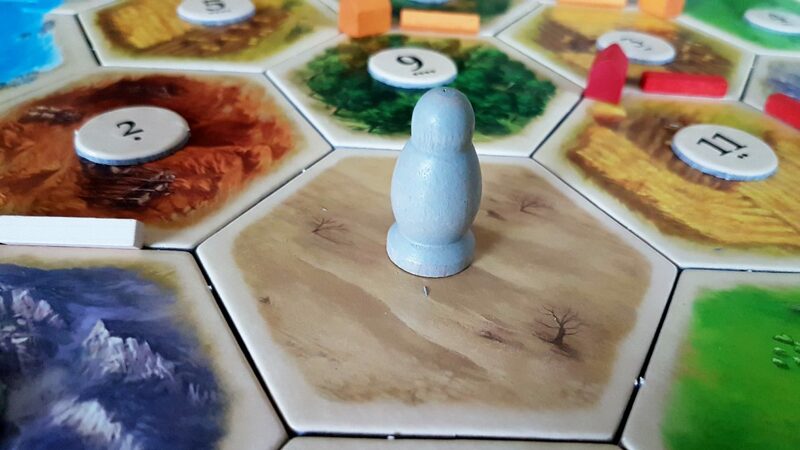 We discussed the kinds of competition Catan encourages in the section on emotional accessibility, but just imagine all of that with players not telling you key information because it helps their case. As usual, our recommendation here is constant – play these kind of games with people that are as interested in the collective fun as they are in their own. Catan tends not to be an especially lengthy game, although games of over two hours are not unknown especially when everyone is playing a tight game with minimal trading. That’s long enough to exacerbate issues of discomfort, and the game doesn’t cleanly support anyone dropping out of play. You will absolutely be sitting on things that other people want – territory, development cards, and so on. It’s not simply a case of redistributing back to the decks either – the nature of play means that not everyone will have the same chance to take advantage of a player’s sudden absence. If you have roads that intersect with suddenly vacant territory you’ll get much more out of it than another player that had abandoned that territory as being over-populated. In the normal course of play, territory doesn’t ever return to contention. As such, if the game loses a player it’s probably necessary to stop play rather than find a graceful way to continue. Given the tight range of the player count (three or four) that means it can be a risky proposition for groups where players have modulating symptoms. There are some wonderful things in the way Catan handles accessibility. I’m in love with the frames it provides for the hexes, and equally enamored with the pips that turn calculating probability into an act of simple arithmetic. I’m less fond of the colour palette, and how cavalierly it treats the issue of representation in the card art. Overall though, its middling performance still manages to put it ahead of games that have more modern design sensibilities. It’s true that the version of Catan we’re looking at here was released in 2015, but it carries with it two decades of accumulated design legacy. It’s also entirely possible that the recommendation in the emotional accessibility section is too heavily drawn from my own experiences with play and as such should perhaps be taken with a grain of salt. Not too big a grain though – as I say, we got a fair number of corroborating viewpoints as a result of reader feedback. I’m glad we’ve covered Catan because it fills a gap in our coverage that has niggled at me for quite some time. 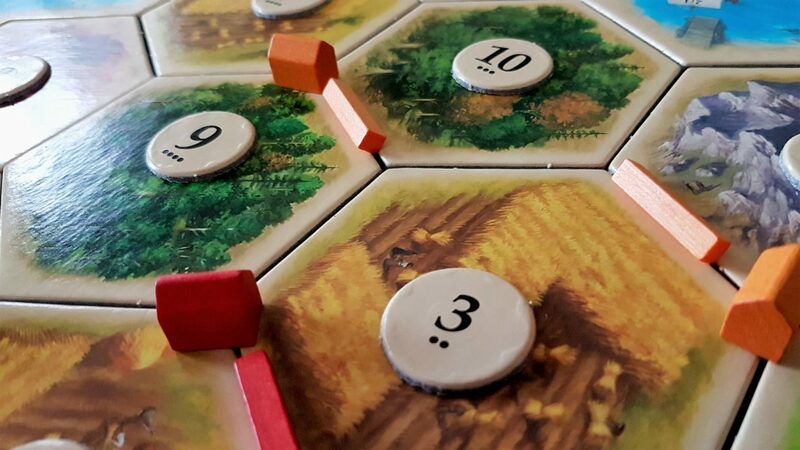 Many new blogs begin their exploration of board games with Catan – it’s something of a tradition, even if it is occasionally subverted for comedy effect. You can’t get away from the influence of Catan if you are at all interested in this topic though, and as it’s one of the games entirely new people might well stumble upon by accident it’s important to include it here. At three and a half stars (which I remind you come with many caveats) it’s a game that still stands up well after all these years. If you want to play it, my poor experiences shouldn’t dissuade you. Let its accessibility profile be a more reasonable guide as to its value in your life.